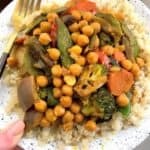 A recipe for easy vegetarian chickpea curry that comes together in less than twenty minutes, is made with fresh vegetables, and makes the perfect quick dinner! Add chicken or beef for a meat variety! 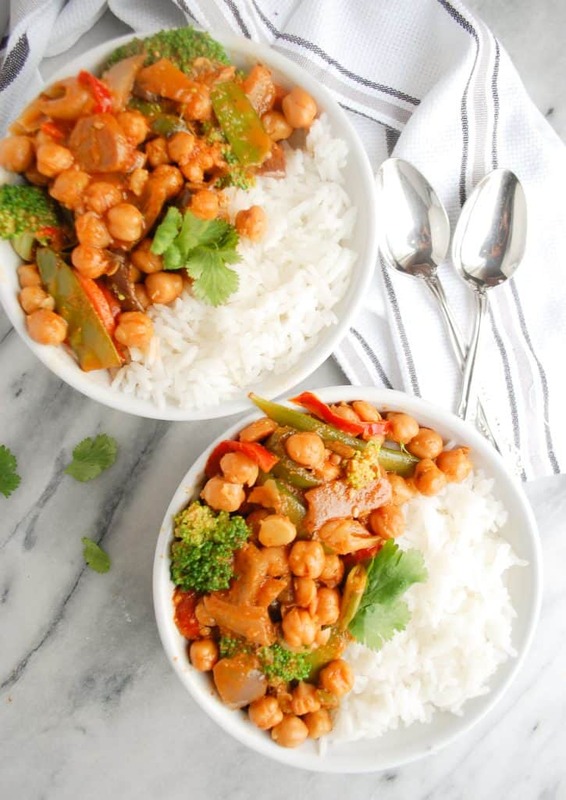 This easy chickpea curry has been one of those meals that keeps showing up on repeat for us. It’s seriously so easy to make and is a hit with everyone, plus there are so many ways to make it different! 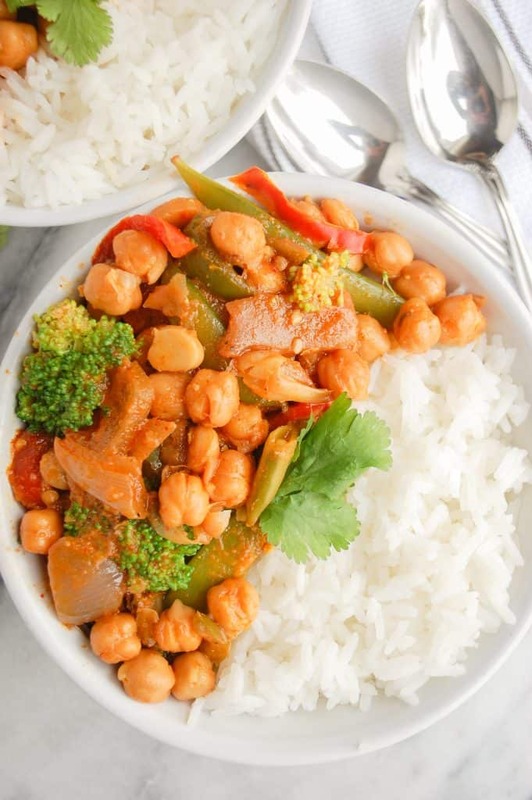 I love adding chickpeas to my curry because I feel like they truly soak up all of the liquid that is in the actual broth and it is seriously so good the longer it sits. When a recipe takes less than twenty minutes from start to finish and is a crowd pleaser with every single guest I have over, I know I need to share it on the blog! I promise if you make this for family and friends, even those who claim they don’t like curry, this will be an absolute hit! Chickpeas: I used canned, but you can also use dry, just prepare them according to the directions on the bag! Canned is an easy alternative and you can wash off the salt by rinsing if you want to keep it low sodium. Mixed veggies: The stir-fry mix from Trader Joe’s is my favorite for this to keep it extra simple, but you can also use a variety of any mixed vegetables you like. We love peppers, snap peas, carrots, onions, broccoli, bok choy, sweet potato. Red Curry Paste: You can also use green! This is sold in every grocery store and adds the perfect dose of flavor – you will be obsessed! My favorite brand is Thai Kitchen. Curry Powder: a blend of spices that really adds flavor to the dish! You can make your own by blending cumin, turmeric, garlic, coriander, cardamom, dry mustard. There are tons of recipes out there, or you can just buy one premade and add it in! Rice or Cauliflower Rice to serve it over! It is seriously so easy + quick to make! All you need to do is saute you vegetables in oil over the stove. Add a splash of broth or water and cover with a lid so the veggies soften. Then add in minced garlic and let is saute up! Stir in the coconut milk, the red curry paste, and the spices and mix until well combined and evenly coated. Then add in the chickpeas and reduce head to medium low, stirring occasionally. Let the curry mixture simmer for ten minutes over low heat, tasting to see if you need to adjust spices. 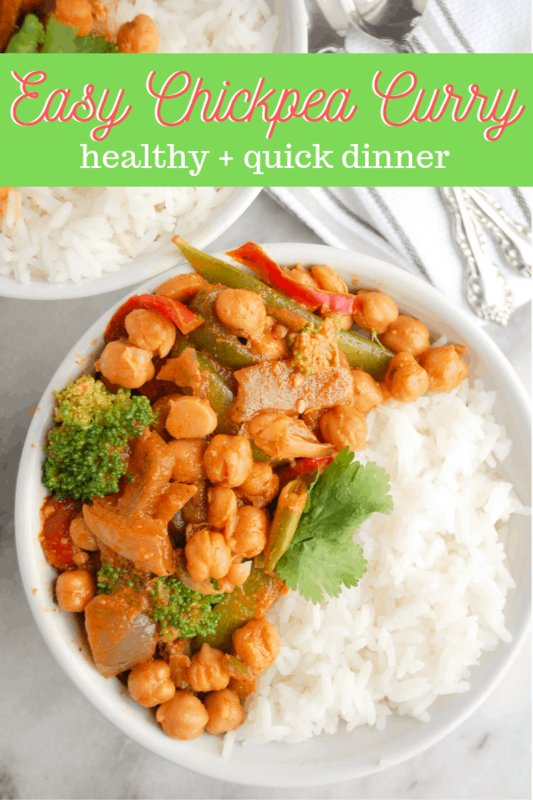 Easy chickpea curry recipe that takes less than twenty minutes to make! 1 can chickpeas, drained + rinsed. 2 Tbsp red curry paste. Add in mixed veggies and water or veggie broth to help the veggies steam. Add a lid and let cook for 6-8 minutes until they begin to get soft. Add in minced garlic and ginger and stir. 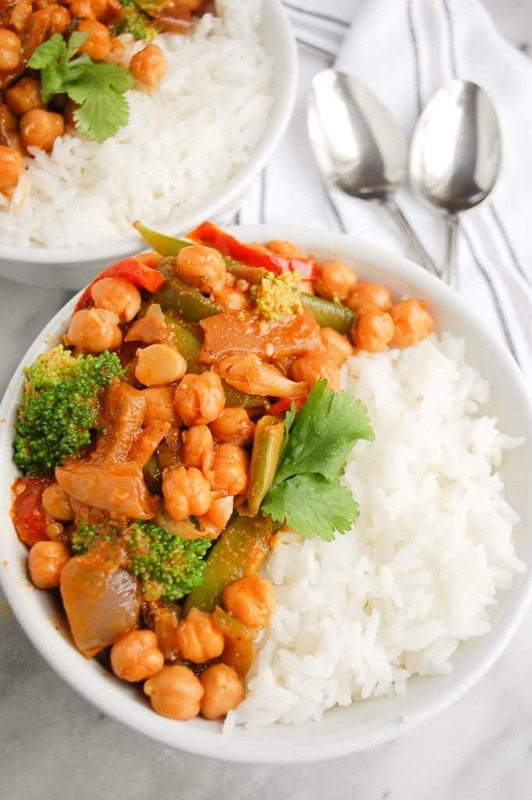 Mix in chickpeas and then stir in coconut milk, soy sauce, red curry paste, and spices until well combined. Let simmer over low for 10-15 minutes, and then serve over rice or cauliflower rice.